Hang two hammocks side by side from just two trees. ENO makes hammocking even better with its lightweight and affordable Fuse Tandem Hammock System. On a recent fly fishing trip in southeastern Minnesota, my wife and I settled on a campsite that had only two trees. Normally we would have to decide between sleeping in a tent (not super comfy), stacking our hammocks (difficult to enter and exit), or hanging them next to one another (bumping hammocks all night). 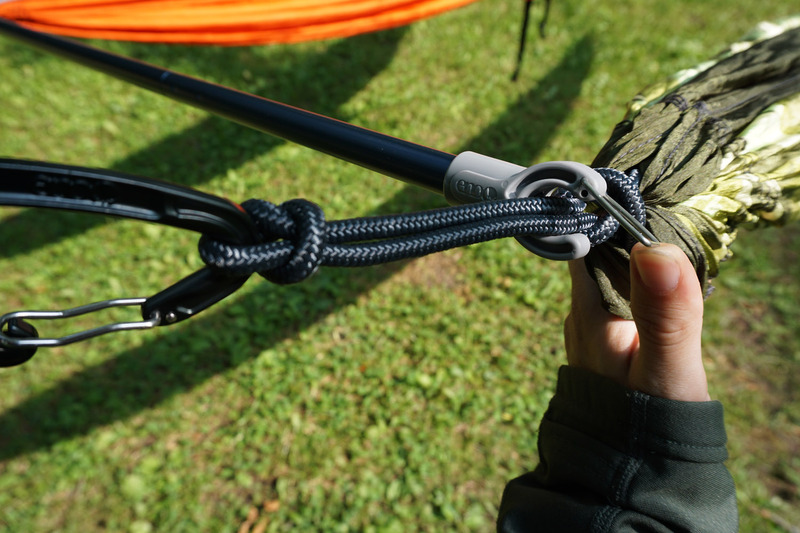 As luck would have it, we received a prototype of ENO’s Fuse two-hammock spreader to test. With it, we were able to sleep side by side, comfortable and happy. In short: I was very excited to see ENO mass-produce a spreader bar and even more excited to see the price: $30. To me, it’s a no-brainer for anyone who likes to hang. We gave it a Best In Show award at the Outdoor Retailer Show last summer. The Fuse will be available to the masses in January of 2018. The Fuse is made up of two aluminum poles. They are essentially tent poles that have clips on both ends that attach to the cords at the head and foot of both your and a buddy’s hammock. Social hanging: It’s nice to hang near your friends, and the Fuse ensures it. Gone are the days of scouring the park or forest for the perfect triangle of trees. Light, saves weight: The pair of poles weighs just 9.8 ounces. If you want to go ultralight, you can bring a single pole and use that at the head end of your hammocks. There’s enough space so your shoulders won’t brush. And because your feet are less wide than your torso, they also won’t touch either. Plus, hanging side by side, you only need to bring one tarp, set of stakes, and cords, further saving weight. Simple design: The setup and teardown are quick and easy. They take about 20 seconds each and are impossible to mess up. Like tent poles, they collapse. Each pole breaks into three 12-inch sections, making it easy to stash in a pack. 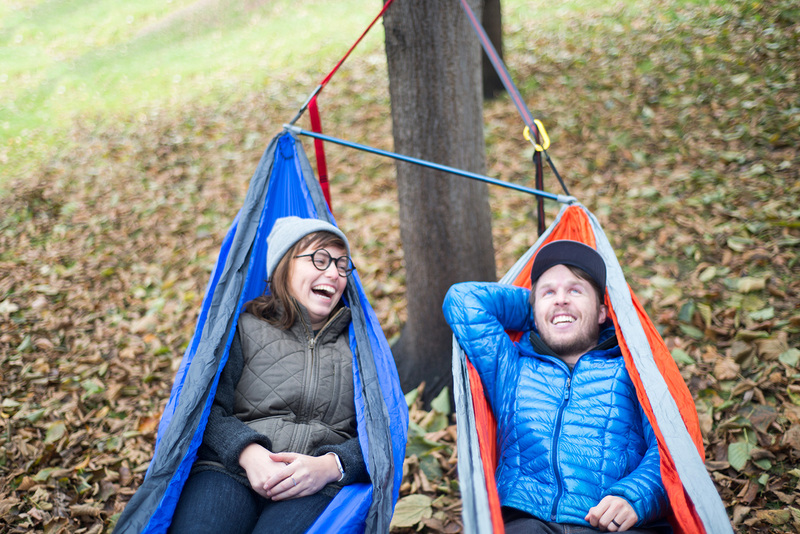 Versatile: It works with a variety of hammock types and brands. And the Fuse is compatible with bug nets and whoopie slings. For best results, the hammocks should be similar in length. Most hammocks are 9–10 feet long. I tested it with ENO’s Sub7 (8 feet, 9 inches) and Appalachian Hammock’s Highland (10 feet), and the difference wasn’t a problem. Footrest: This was an unexpected bonus. 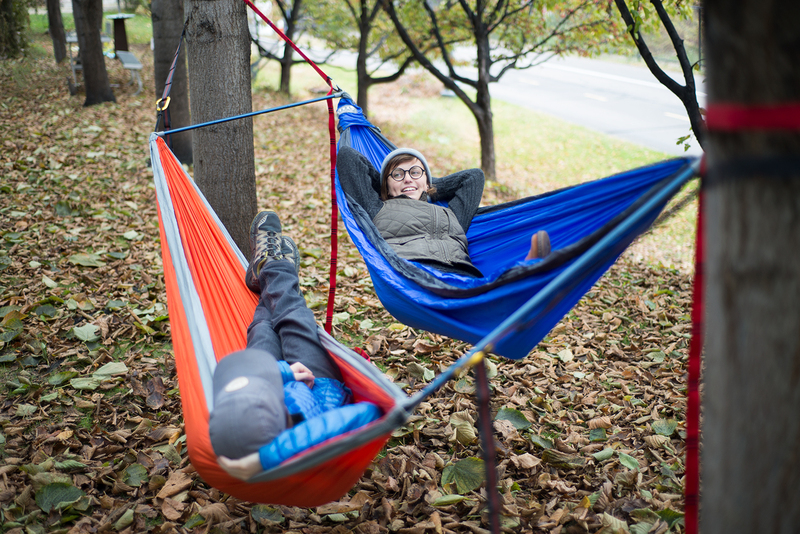 If you’re sitting in your hammock instead of lying down, your friend’s hammock acts as a footrest and vice versa. It’s incredibly comfortable. Price: Just $30! I can see this being wildly popular at this price. Having both poles is nice, but if you’re on a budget, one would work. You could buy a set and split it and the cost with a friend. Teeter-totter effect: Spreader bars effectively turn your hammocks into a teeter-totter. If you get up in the night, you need to remember to do it slowly or your friend will quickly drop toward the earth – not a pleasant way to wake up. Bouncy: There is a little sway and bounce if the other person moves. It’s not a ton and is definitely not enough to wake someone up. I find that most hammock sleepers stay fairly still at night becuase they’re essentially in a cocoon, and there isn’t anywhere to go. Weight difference: As expected, people of different weights hang at different heights when using the Fuse. You can counter this to an extent by adjusting the suspension on the hammock, making one hammock tighter and one looser. Or, you can just hang at different heights. It’s not really a big deal. People have been trying to find a good way to hang next to each other from two trees/anchors for a while. So it’s necessary to acknowledge a few other options, and to ward off angry Internet comments. Hang from a tree with a large diameter and set up the suspension on the right and left sides of the tree so they are as far apart as possible (and hope you won’t rub too much). Arrange hammocks with your heads on opposite ends to try to offset your hips so they don’t bump. Hang one hammock a few inches higher to help avoid contact. Use a stick you find in the woods to separate the hammocks. It’s free but can fall out. Try a few DIY options from HammockForums.net. For an even lighter tandem hang, check out DutchWare’s Double Hammock Whoopie Hook Complete Suspension. We haven’t tested this, but it looks slick. All in all, I’ve been really happy with the Fuse. It’s very easy to use and offers a comfortable option for hanging with a friend. It makes hammock camping and causal hangs a lot better for a small price.